The recent financial crisis has raised many questions about the role of credit-rating agencies (CRAs). With the boom of structured finance products, these agencies ramped up their business and earned enormous profits (Moody’s, for example, tripled its profits between 2002 and 2006). Ratings quality seemed to decrease substantially, as structured finance products were increasingly given top ratings shortly before the crisis hit. Structured finance products generally pool assets such as mortgages or other types of loans and issue bonds against the pool. The bonds have a ‘waterfall’ or priority structure, where some are risky (junior) and face the first losses from the pool, and some are safe (senior) and only face losses if the risky bonds have defaulted. The process of structuring involves a tight collaboration between issuers and rating agencies who rate the bonds. Issuers depend on rating agencies to certify quality and to be able to sell to regulated investors. Beyond directly paying CRAs for ratings (the issuer-pays system), Griffin and Tang (2012) write that the CRA and underwriter may engage in discussion and iteration over assumptions made in the valuation process. Agencies also provide their models to issuers even before the negotiations take place (Benmelech and Dlugosz 2009). These products are characterised by careful selection of the underlying asset pool and private information about asset quality. In a recent paper (Josephson and Shapiro 2019), we ask how CRAs influence the structure of such products, and how the products’ structure changes with market incentives. We present a reputation-based model of rating structured products. An issuer has a set of safe and risky assets that it can put into a pool and issue securities against. A CRA assists in the structuring of these securities and rates them. The securities have a waterfall/priority structure, as described above. The prospect of earning future profits can give the CRA reputational incentives to provide accurate ratings. A principal motivation for securitisation is to appeal to investor groups with heterogeneous preferences. The senior securities are designed to appeal to constrained investors, who can only purchase investment grade securities, i.e. securities with a rating above a certain level. Constrained investors may be constrained by regulations (for example, banks, pension funds, and insurance companies are often restricted in the types of assets they may hold), internal by-law restrictions/investment mandates (e.g. Baghai et al. 2018), or their portfolio hedging requirements. In the model we posit that there is an exogenous rating constraint imposed on them. The unconstrained investors are willing to purchase any security. These investors may be hedge funds or other institutional investors. The junior securities are designed to appeal to these unconstrained investors. The CRA may include safe assets in the pool to be able to sell to constrained investors. This creates scope for rating inflation, which relies on passing on risky assets as safe ones. Our first result is that, for some parameters, the equilibrium has the CRA only including risky assets in the asset pool. This implies there is no rating inflation, as there is no scope for substituting risky for safe assets. Nevertheless, through the structuring process, there will still be senior securities to sell. And this achieves the first best allocation, as there are larger gains from trade for risky assets. This is more likely when there is less demand for safe securities, more demand for risky ones, and the rating constraint is lax. When the CRA includes safe assets in the asset pool, rating inflation becomes possible. Rating inflation is important to examine as it is directly related to surplus. Rating inflation (a) measures the amount of adverse selection/misallocation there is, and (b) can lead to excess risk being taken on by investors. Rating inflation depends on the rating constraint. For parameters such that rating inflation is possible, rating inflation is decreasing in the tightness of the rating constraint, as this makes rating inflation more likely to be discovered. We demonstrate that the relationship between rating inflation and the tightness of the rating constraint may be non-monotonic. This can be seen in Figure 1, which depicts the minimum discount factor necessary to sustain an equilibrium without rating inflation (continuous red curve), and the corresponding types of equilibria for a particular discount factor (black dashed line). When the rating constraint is lax, only risky assets are included, which, as discussed above, leads to no rating inflation. 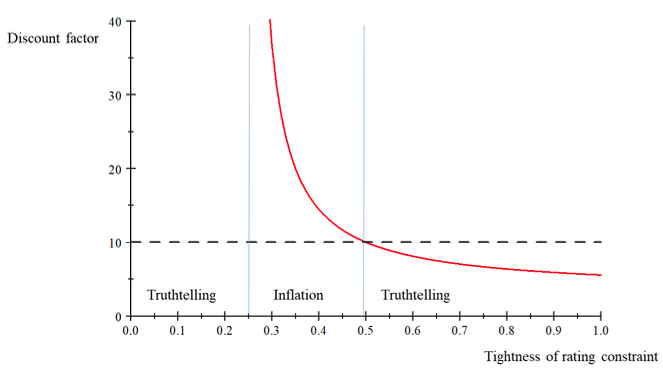 When the rating constraint is tight, there may not be any rating inflation due to a higher likelihood of being caught. Intermediate tightness of the rating constraint involves positive amounts of rating inflation. Interestingly, this indicates that new markets that don’t have many constrained investors may not need to be heavily scrutinised by regulators as there will be little inflation. When structured finance products were first issued, they received little regulatory scrutiny and rating agencies were still refining their ratings models for these products. Cornaggia et al. (2017) offer suggestive evidence that there was little rating inflation before 2002. More advanced markets, however, deserve stricter scrutiny. We also show that rating inflation is increasing in the wealth of unconstrained investors, as it allows more risky assets into the pool, decreasing the likelihood that inflation is discovered. Rating inflation is also increasing in the value of retaining safe assets, as this makes it more desirable to substitute risky for safe assets. Temporary increases in wealth or the demand for securities increase the incentive to inflate ratings to capture higher profits. Finally, we provide two new motivations for the pooling of assets: (a) a mechanical reason of tailoring products for constrained investors; and (b) a novel explanation of the CRA balancing the informational advantage over investors with the need to maintain its reputation by choosing the right mix of safe and risky assets to include. Baghai, R, B Becker and S Pitschner (2018), “The Private Use of Credit Ratings: Evidence from Investment Mandates”, working paper..
Benmelech, E and J Dlugosz (2009), “The alchemy of CDO credit ratings”, Journal of Monetary Economics 56(5): 617-634. Cornaggia, J N, K J Cornaggia and J E Hund (2017), “Credit ratings across asset classes: A long-term perspective”, Review of Finance 21(2): 465-509. Griffin, J M and D Y Tang (2012), “Did subjectivity play a role in CDO credit ratings?”, The Journal of Finance 67(4): 1293-1328. Josephson, J and J Shapiro (2019), “Credit Ratings and Structured Finance”, CEPR Discussion Paper 13534, also forthcoming in Journal of Financial Intermediation.